From 2010 to 2018, the RS232 interface has been available. Using this interface, the PC's serial or USB port can be used to monitor POCSAG, FLEX and Mobitex networks in combination with PDW. Since its introduction, several hundreds of interfaces have found their way to satisfied users worldwide. For some time, I had the desire to develop a USB version of this interface. The availability of a ready-made USB module through ebay made this a lot easier. There was a snag however: these modules appeared to have cloned FTDI chips that are not supported by the latest drivers. Therefore, a new version of the USB interface has been developed. 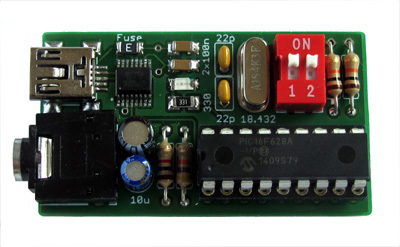 On all FSK to USB interfaces sold through this site, genuine FTDI chips are used from Farnell/Mouser. It ensures that the latest FTDI drivers will work with this interface. 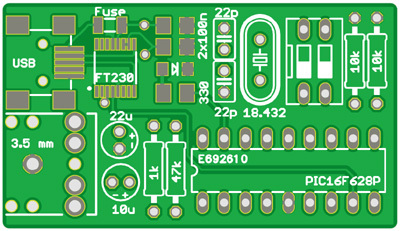 The new USB interface [schematic] [partlist] is based on a PIC16F628 microprocessor. It runs on a frequency of 18.432 MHz. This microprocessor has a built-in comparator ('2 level interface') and a hardware UART. The FT230 IC communicates with a PC's USB port through the mini USB connector. 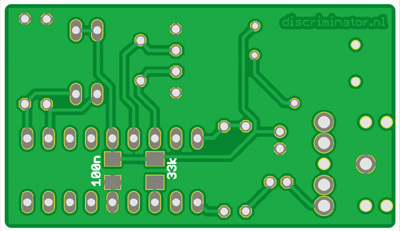 A double sided circuit board has been designed. Two SMD components are mounted at the bottom of the circuit board. To use this interface, you should download the latest version of PDW (version 3.x). 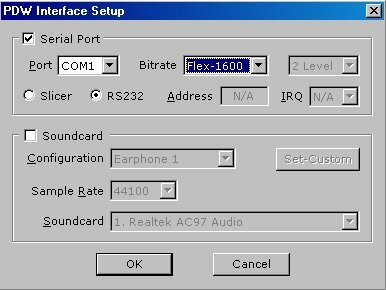 In the 'Interface' settings in PDW from version 3.0, the user can now choose between 'Slicer' (the 'standard' 2 or 4 level interface) or 'RS232' (this interface). It takes some getting used to this: changing between different data standards requires the user to change the settings on both the interface and in PDW. The new version of the USB interface is available since March 2015. You can order a built and tested interface, or just the circuit board with a programmed and tested microprocessor and the FTDI chip. Only consider to assemble the interface yourself if you feel comfortable in fine-pitch SMD soldering.